For homeowners looking for the ultimate in secure entrance doors for the home, composite doors from Keepout are the perfect choice. Made from a combination of a thermally insulating core covered with an external skin, our composite doors have been designed from the ground up to offer unparalleled levels of security. With their impact-resistant GRP skins and thick profile design, our composite doors have been tested to PAS 24 security standards and provide a more robust, substantial entrance to your home when compared with dated door styles. 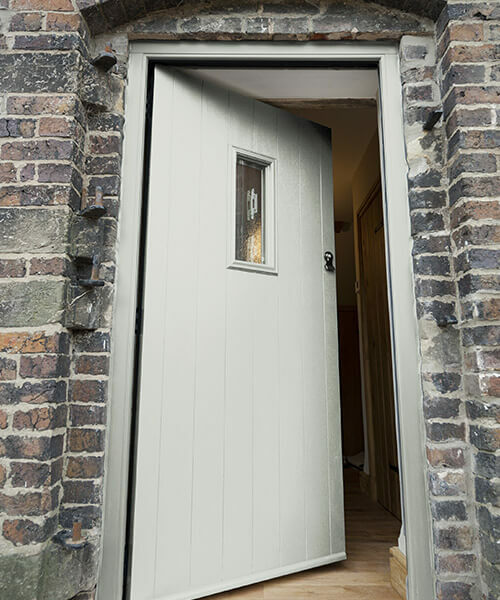 Our composite doors are also available with cylinder free locks, giving you peace of mind that they have been manufactured to resist intrusion. Keepout composite doors are all made with thermally insulated cores covered with a GRP (Glass Reinforced Plastic) skin. This hybrid design means that our composite doors are excellent thermal retainers – effectively sealing your home from the elements and keeping the heat within your home during the colder months of the year. Combined with efficient double glazing as standard, Keepout composite doors are capable of achieving an ‘A’ energy rating, exceeding the standards set by current building regulations. For further improved energy efficiency, we’re even able to supply our composite doors with thermal glass. Our entire colour range is extensive, featuring both contemporary solid colours and more traditional woodgrain finishes to suit both modern and traditional homes. Whatever your tastes, Keepout have the composite door selection to suit you. We offer a range of alternatives to composites too – all of the materials used in our doors boast the most up-to-date technology, including WarmCore aluminium, modern uPVC and durable timber. This helps to benefit you and your property all year round with security, thermal efficiency and stylish aesthetics.